Erica Cook | Calgary Based Lifestyle Blog: Love This! I could have used this Saturday. It rained all day. We watched movies and ate nachos and cookies instead. The day was peppered with an array of end of year school projects for the boys. Back to the picture though... don't you love that hardware? Happy Monday. Gasp! 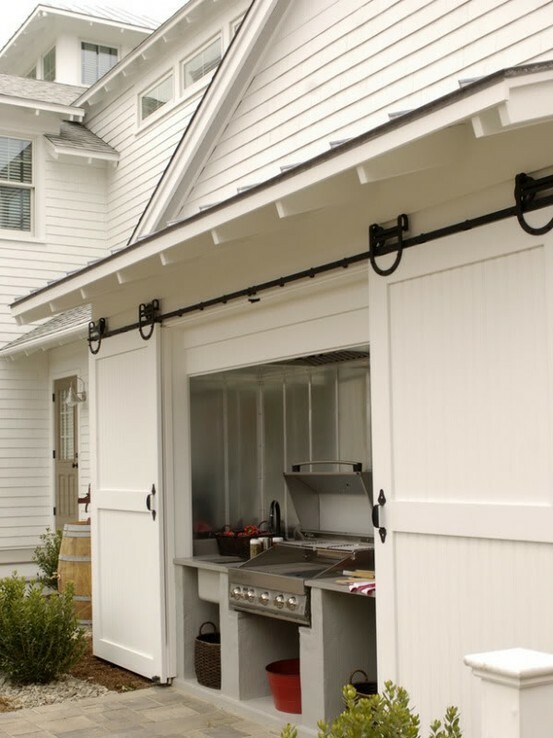 I'll take almost anything with a sliding barn door but this is an excellent idea! Perhaps if I show my husband that set up for a barbecue maybe he'll want to build one. ... I love how it can tuck away. The hardware is GORGEOUS. Love the hardware & that you can close it up when you aren't using it! Me too! That is from one the the Dream Homes I think. Love it! I'm a new visitor and I have to say I love your blog. Every project is like a piece of art. Barn doors! Yup, this is brilliant! Hello where can I purchase the barn door?